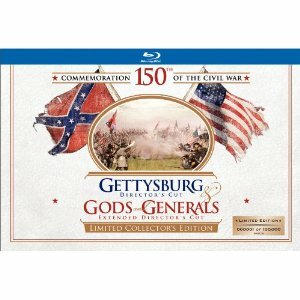 WorldMovieStore - Gettysburg Gods and Generals Sinopsis. Marking the 150th-anniversary commemoration of the Civil War, Ronald F. Maxwell’s acclaimed film now arrives in a Director’s Cut featuring 17 minutes of compelling additional footage. The story of actor and future Presidential assassin John Wilkes Booth (Chris Conner) is newly integrated throughout the narrative alongside the legendary heroism of Joshua Chamberlain (Jeff Daniels), “Stonewall” Jackson (Stephen Lang) and Robert E. Lee (Robert Duvall). Read More Sinopsis. 0 Response to "Blu-ray Release Gettysburg Gods and Generals"